We recently discussed 4 of our best SUP racks, but now want to take the time to provide more detail on one of those best-selling paddle board racks, the SUP Ceiling Rack. The SUP ceiling rack is made to mount to your ceiling to take advantage of unused overhead space to store your paddle board. This rack is perfect for your garage, shed, basement, or any room in your house (although some decorators may disagree with me there - they're wrong!). 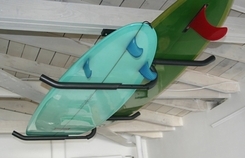 Mounted to your ceiling, the rack stores your paddle boards horizontally. This rack comes as two supports made from steel, so it is plenty sturdy enough to store your paddle boards. The steel rods are powder coated in a black matte finish, are 1" in diameter and are formed and welded with lifted tips so your board stays secure in the rack. We know paddle boards are huge and heavy; this rack is durable and up to the challenge to store your boards. The steel rods are also covered with nitrile foam to make sure that you don't ding or scratch your paddle board when sliding it into the rack. This nitrile foam is not "pipe insulation" - it is foam rubber that is more similar to the foam on the hand grips of a chainsaw or other power tools. An additional feature of this rack is that it is expandable so that you can add more rack "levels" and create a stacking storage system for multiple boards. 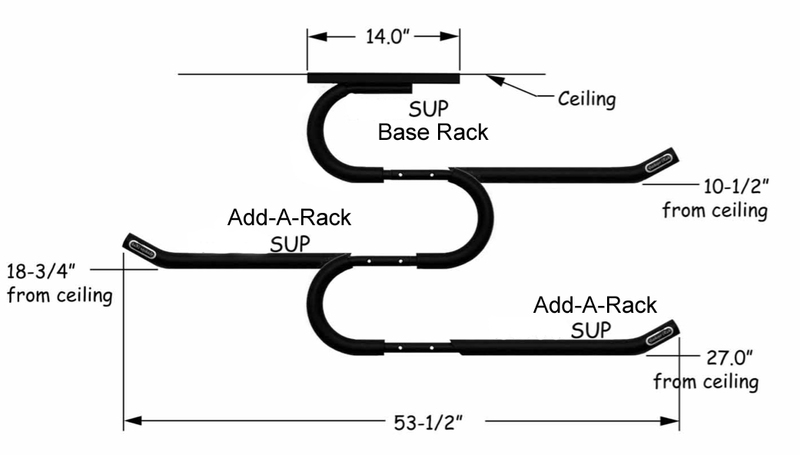 You can see in the graphic what this looks like; stacked rack storage with openings on alternating sides to allow you to slide your boards in and out of the ceiling rack. The dimensions are also listed so you can be sure the rack holds the boards that you have. And you can interchange the "SUP Rack" with the "Surf Rack" depending on what boards you want to store. 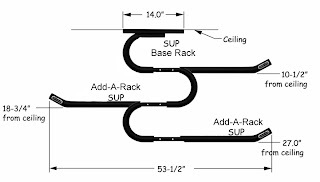 More details are available on the SUP ceiling rack page. Head there to check out why so many of our customers have chosen this rack to store their paddle boards.